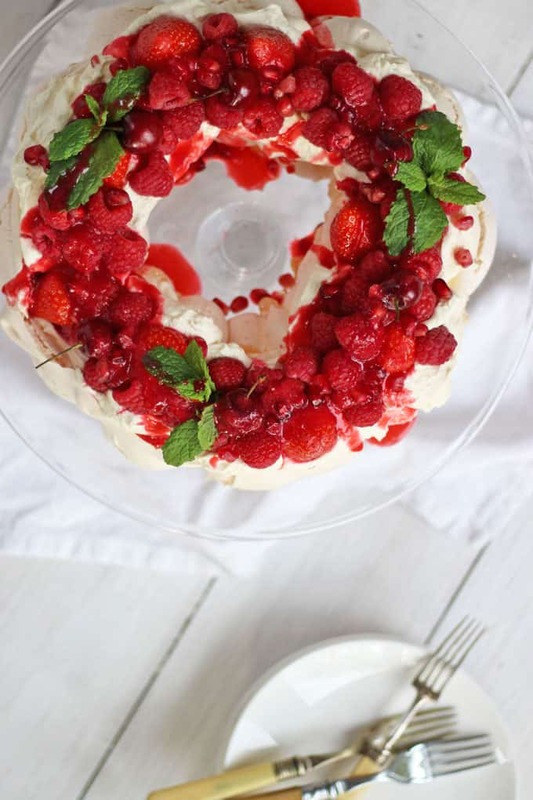 This Christmas wreath pavlova is the perfect meringue dessert for the festive season. A make ahead pudding, light and deliciously topped with cream, fruit and coulis, this is the ideal finish to the meal on the big day! 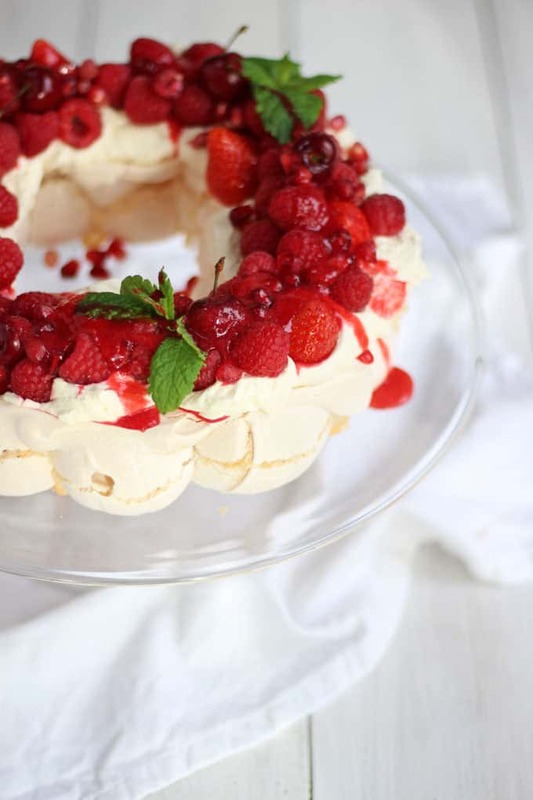 I love pavlova, it’s the perfect make ahead pudding. You can bake the meringue base days in advance and just pop your toppings on at the very last minute. 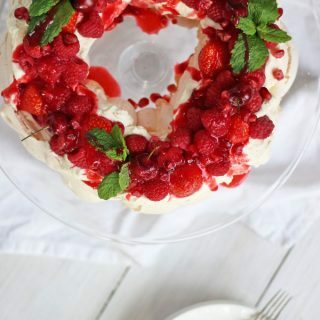 This Christmas Wreath Pavlova is a brilliant dessert for Christmas day when we would all rather spend time with family rather than making a coulis. I first made a Christmas Wreath Pavlova quite a few years ago, but last year when I made it for my Contact the Elderly Christmas tea party heaps of people were asking me about it. So I’ve finally got around to making a little video of it. Make sure that you use a VERY clean bowl to whisk your egg whites in, they won’t fluff up otherwise. Be sure to use baking parchment (or baking paper) not greaseproof paper to line your baking sheet. The meringue won’t peel off otherwise. You can make the meringue base a good few days in advance. You can also make the coulis and whip the cream the day before, then just assemble at the last minute. Assemble as late as possible to avoid soggy meringue. 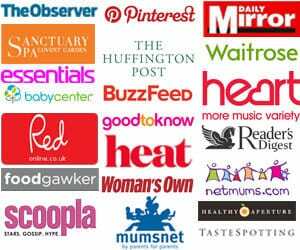 If you’d like to save time, you can buy ready made fruit coulis. Gradually add the sugar, whisking well in between each addition. Spoon into a wreath shape on baking parchment paper on a baking sheet. Bake at 140C for about an hour. Turn off the oven and allow the pavlova to cool in the oven. Meanwhile, make the coulis. Mash the raspberries and then squish through a sieve. Stir in 2tbsp of the icing sugar. Whisk the cream in another bowl and then stir in the other 2 tbsp icing sugar. When you are ready to serve, top with cream, fruit and coulis.